Conflicts between you and your roommates are bound to happen. If it’s not about who needed to do what chore or about someone never seeming to restock what they use, there’s always another thing to be bickering about. These conflicts can range in severity – a typical call-out in the roommate group chat, or a full-on sit-down meeting between roommates to hash things out. During college, you are typically going to be living in a space full of varying personalities, and everyone’s wants and needs can vary drastically. A difference in opinion with roommates can become very apparent when the topic of pets comes up. Prior to beginning negotiating with your roommates, it is important to establish what each roommate is looking for in their ideal living situation in relation to pets. Sit down together to openly discuss what each person wants or what their deal breakers are. Remember to encourage everyone to speak up their true feelings, as the open discussion is a place where honest discussions are going to happen. Meaning, it is not going to be the time and place to directly hash everything out and argues the moment someone hears something they do not like. What kind of pet they want (cat, dog, rodent, reptile). The size of pet they want – some people don’t care what type of pet is in their living space but may want it to be restricted to smaller animals. The space they want the pet to occupy. Some people will allow their pets to roam the apartment freely at any and all times, while others may want to keep a pet restricted to a single room. The ownership/responsibility of the pet. While everyone can take part in taking care of the pet, someone will usually have to step up as the “main” caretaker – who is signing papers and keeping the pet at the end of the day? How many pets is everyone willing to house? Take note of what everyone says, as it will act as the baseline for future negotiations about talking about pets with your roommates. This is the opportunity to open up a space for negotiations, rather than making false promises or guarantees that any one roommate is going to get their way from the start. By opening negotiations with an open discussion, everyone is given an equal chance to be heard. 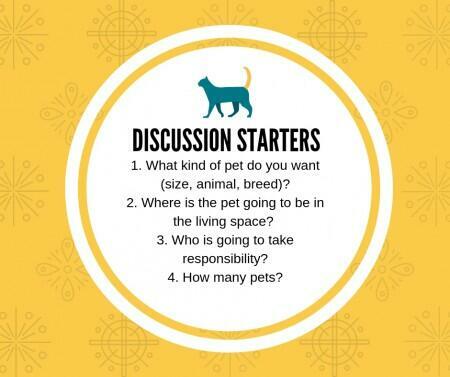 Once you and your roommates discuss what you want and do not want when it comes to pets, the next step is to consider what is repeated or shared between different roommate’s lists. Maybe someone wants a cat, while another roommate doesn’t care what type of animal as long as it is somewhat small. Or maybe there are shared deal breakers – maybe reptiles are non-negotiable if one of your roommates has a fear of them. It’s important to find common threads to connect everyone’s lists as it will help you narrow down the type of pet you and your roommates are looking for if you are looking for a pet at all. It can also help lead you to compromise on more specific issues, such as where to keep the pet or how much everyone is expected to take part in taking care of the pet. Take note of repeated desires or deal breakers. The more something is repeated, the harder it is going to be to argue against if the majority of the apartment/house is going to for a certain type of pet or against a certain type of pet. You can still attempt to negotiate what is often repeated, but it is definitely going to be a bit harder if you are in the minority. It is very unlikely that all of your roommates are going to want the same option to begin with, and even more unlikely that all your roommates will be willing to settle for one option of the person that wants it argues or looks sad enough. You are most likely going to have to pick and choose from each option to make an entirely new option that had not been considered, to begin with. Identifying the common threads between each roommate’s like and dislikes can help lay the basis of negotiation when you can make it easier for more people to be happy with the final decision when you can have everyone’s desires listened and acted upon, even if it is in a small way. Part of the process of negotiating with roommates is being open to trying out what each person wants to see if it is an ideal situation for each person’s wants. It is important to assert that “testing out the waters” does not automatically equate that the situation is final if it seems to “work.” Remind everyone that it is just a way to navigate through negotiations and to get a realistic look at how different options will work for you and your roommates. This doesn’t mean to go out and adopt the first pet you fall in love with – you cannot just go and adopt a pet and return it when it doesn’t exactly work out. Instead, try asking around your friend group or your roommate’s friend groups to see if they would be willing to have you watch their pets in your own living space to mimic what you can potentially be placing into your home. If you want to see how you and your roommates would be with a dog in your living space, ask a friend if they would be willing to let you puppy-sit. This is a great way to get a realistic glimpse at what can be. Having a dog sounds like a great idea until you realize that you and your roommates are not home nearly enough to properly take care of a dog. 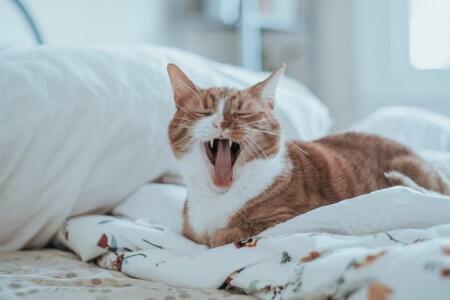 At the same time, you can want a cat after spending hours looking at cat videos but a weekend of cleaning litter boxes can completely turn you and your roommates off from the idea of inviting a cat into your home. Do not stop at testing the waters when one option happens to work if you other options left to explore. If you stop at one try, you are eliminating the chance to find options that may suit you and your roommates better. It also may have some roommates feel like they were not given a chance to explore what they really wanted when their option was not given a try. When trying out different options, remind yourself and your roommates that keeping an open mind is important. You may go into negotiating the pet issue wanting a specific outcome, but may be completely surprised to find that you may want to go with the option you were very much against prior to negotiating. The more open and willing to try out different scenarios you are, the easier negotiations will be down the line. Talk about each roommate’s reasons for their first opinion. One roommate may be dead set on having a cat as a pet, but it’s really because they want the typical laidback personality of a cat. If the rest of your roommates want a dog, consider getting a dog with the laidback personality your other roommate is looking for. This way, the singled out roommate is not instantly ignored when it comes to what they want and they can feel like there was an effort to compromise with their desires. Who knows, they may have been a secret dog person all along. There is no guide to making sure everyone’s needs are somewhat met, but what you can do is make sure that everyone’s “list” is thoroughly checked and paid attention to. You might be so fixated on what you wanted to assert in your original discussions that you were not paying as close attention to your other roommates’ wants. Double check everyone’s wants because there are often overlooked solutions or compromises when contrasting opinions can initially be overwhelming or intimidating. People can have various reasons for staying away from certain options, and it’s important to give their reasons consideration even though all you want is for your option to be the one picked. Two roommates can have their hearts set on bringing a puppy into your living space, but another may have had bad experiences with a dog before. Instead of listening to your heart’s desire, the best decision is to respect everyone’s right to a comfortable living space. Decisions usually do not happen overnight, and the decision on what kind of pet or if you are even getting a pet, definitely is one the should take time to come to. Not only are you and your roommates signing up for a big responsibility, but you are going to have to make sure that every single person is comfortable with your decision. The more rushed the decision is, the more likely that at least one person is going to be upset with the decision that has been made. As much as you or your roommates want a decision to be made from the beginning of negotiation, it is important to take time when discussing the issue of pets between roommates. Have a sit-down talk (or multiple) throughout negotiations. Take time to explore multiple options, then discuss them. Decisions do not come easy. While it is easy to become impatient, don’t make an impulse decision that can leave one, or many, uncomfortable. It’s important to remember that everyone has a right to their living space when negotiating the issue of pets between roommates. 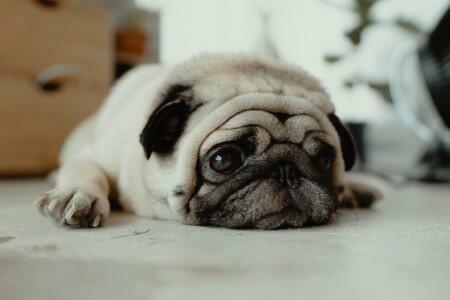 As much as you and some of your roommates really want to get your dream dog this year, one roommate putting their foot down and saying they would rather not have a dog is enough to stop you in your tracks. While it does feel bad not to get your way, remember that everyone’s comfort should be respected in their own living space. Put yourselves in their shoes. What if you were the one that didn’t want the pet or wanted a different option, and no one was paying any attention to your own desires? It would not feel good and potentially generate stronger ill feelings toward your roommates and your living situation. You definitely do not want that for yourself, so why would you put your roommate(s) into that kind of situation? Sure, you may not have gotten the pet of your dreams at the end of negotiations. Remember that your current living situation is more than likely not going to be the same forever. Roommates change, living situations change, and so will opinions. What didn’t work out now, may work out in the future. Not getting the results you wanted does not have to mean not talking to your roommates for the end of the day when you can always explore other options later on. It’s more important that everyone is comfortable, which is the living situation they signed up for. At the end of the day, you want your roommates to feel comfortable with the final decision. It may take some time to work through issues when everyone is bound to have different opinions. Don’t let contrasting opinions keep you from trying though! Good communication is key when it comes to solving problems, and you will never know the outcome of negotiating about pets between roommates will turn out if you do not try. Hello! I'm Kaitlin, a fourth year Literary Journalism major at UC Irvine. I'm a writer on Uloop's national team and a campus editor for UCI. SUMMER SUBLEASING!!! Camino del Sol! !